You can use this Troubleshooting Guide template to help users detect and correct problems with software, electrical or automotive systems. This 12 page MS Word template also includes a Free Excel spreadsheet for sample entries. You can use this Troubleshooting Guide template (MS Word 12 pages) to help users detect and correct problems with software, electrical or automotive systems. This template also includes a Free Excel spreadsheet for sample entries. 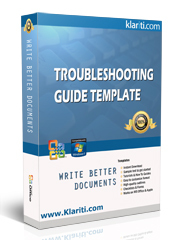 Download Your Troubleshooting Guide only $4.99! Help developers, users and testers when troubleshooting a new application, network, or testing cars, electrical or automotives. Identify prerequisite skills and knowledge required for various roles is detailed below. Identify what Developers or Users must be experienced with before using the software, car or device. Provide guidance on how developers can reduce the likelihood of errors occurring in the application. Describe how you can minimize the number of anomalies introduced into your solution through development practices, better coding, frequent testing, repeatable deployment, and source code control processes. Discuss Development Best Practices, such as how to minimize the errors introduced into your application by following a consistent rule for naming namespaces. Who Should Use This Troubleshooting Guide? This document is designed to help end users, developers, and System Administrators who are building, deploying, and using your application. Of course, as this template is very easy to modify, you can use it for other areas, such as when troubleshooting cars, automobiles, electrical appliances, home systems, and networks. The layout of this template means that you can adjust it very quickly and use it for your own requirements. Bold - Command and option names appear in bold type in definitions and examples. The names of directories, files, machines, partitions, and volumes also appear in bold. Italic - Variable information appears in italic type. This includes user-supplied information on command lines. Monospace - Screen output and code samples appear in monospace type. Angle brackets < > surround user-supplied values. Percent sign % represents the regular command shell prompt.